You may remember my kitchen makeover from our old house. 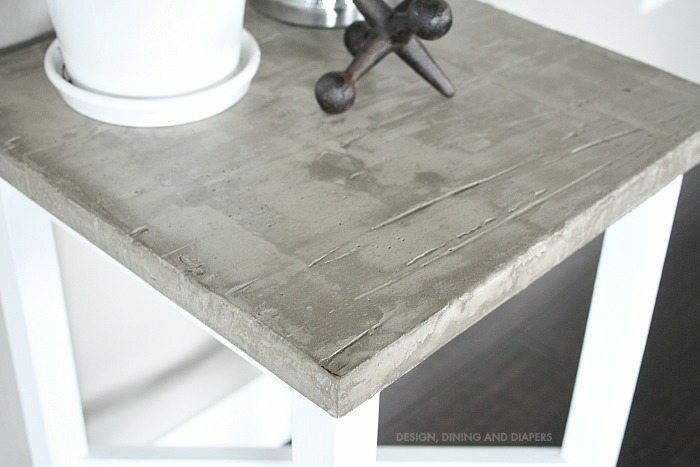 I put in DIY Concrete Countertops using Ardex Concrete. You can read all about the process in the post. Fast forward to this weekend. We are still going through our things in the garage (yes 5 months later) and I realized I didn’t have a place for the side table that we used in our old nursery. 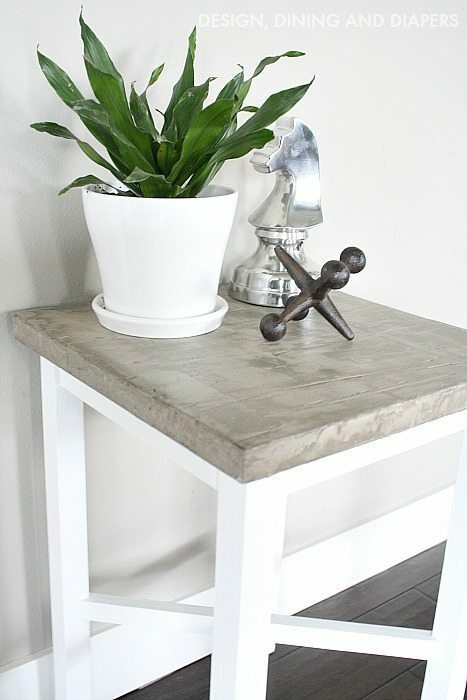 This side table makeover was so easy to complete. All I did was use left over ‘chalky paint’ and concrete left over from our countertops. I love the new industrial chic look, it definitely fits in with our new home now! 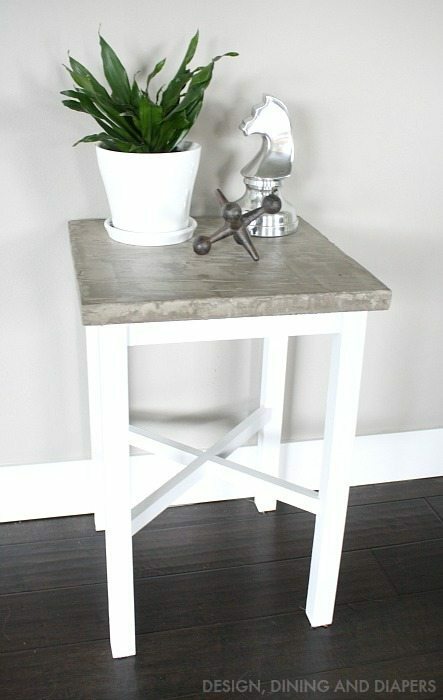 I started with a really basic small side table that I purchased from Target several years ago. I contemplated selling it, but then I always stop and think, “what could I do with this and make it work for our home?”. I had some left over chalk paint from my farmhouse table makeover and decided to try it on the base of the table. It’s a very subtle gray color, you would think it was white, but it’s actually called cosmopolitan. And then of course I finished it in a coat of wax. The top of this side table was a complete experiment. I did a lot of research when placing this concert on top of my formica countertops and knew it was doable, but to be honest placing this concrete directly on top of wood was a new thing for me. So we will see how this little experiment turns out. So far so good! 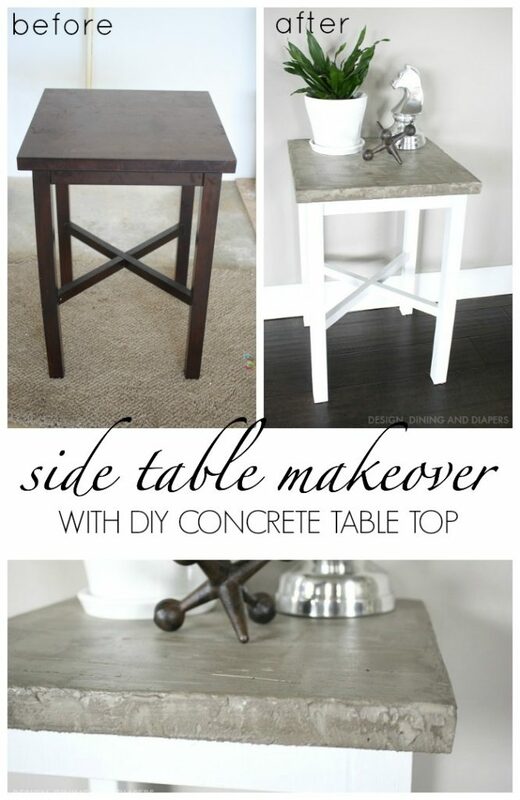 You can read all about how to apply the concrete here. I love the new look and it goes perfectly in our new home! I still can’t believe how easy it is to transform a piece of furniture. 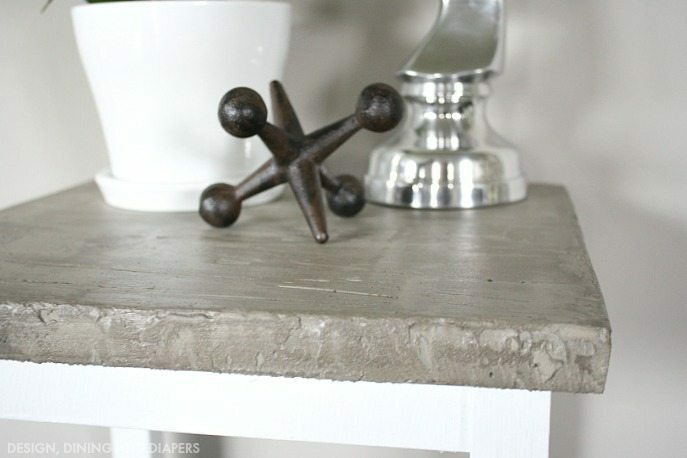 Unlike our kitchen countertops that I sanded for hours and hours and was extremely OCD about making them perfectly smooth, I chose to keep these a little more rustic and I wanted to see the natural imperfections of the concrete. 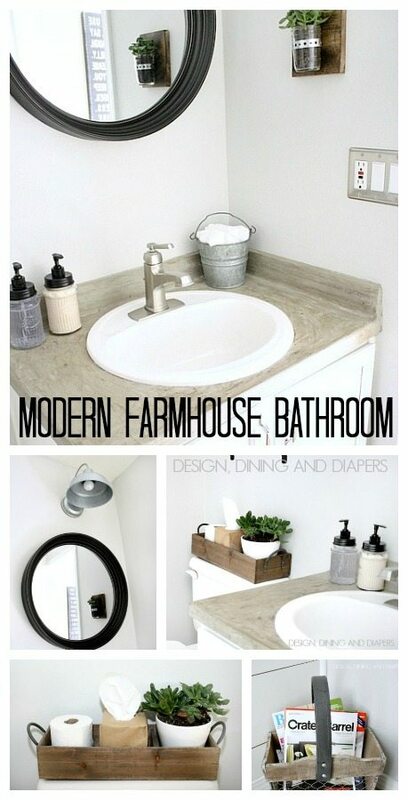 I’m looking forward to sharing more DIY projects soon and even more peeks at the family room too! Okay, this is SO CUTE! 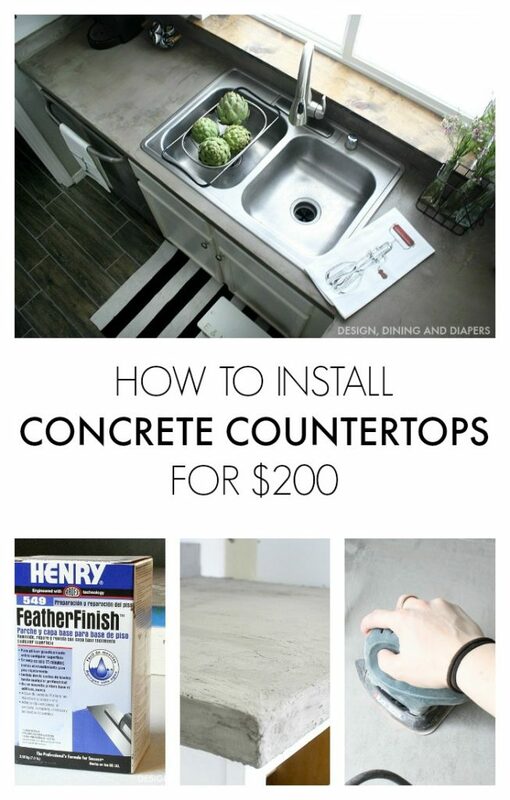 And I’m also contemplating doing concrete countertops too! Wow – this is so cute! 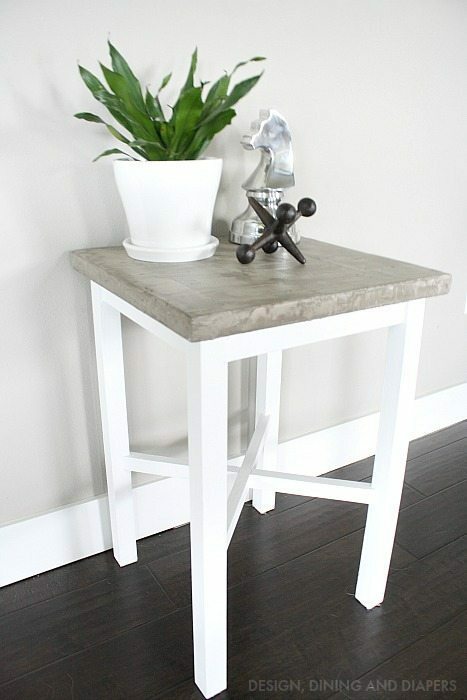 And perfect timing – I just grabbed a small end table today from storage for my living room and was wondering how to transform it!! Hi! What a great idea! How has the concrete held up on wood? I’m contemplating this for our two oak side tables that are so sturdy but so not our style. Hi! It has held up great. I know several other bloggers who have done dining room tables with it. I believe East Coast Creative did one. You might want to check hers out!